The paper aims at working out a number of practical recommendations for possible improvements in the raw corn starch shop wastewater system of “Novlyansky” public company. The statement of need for the effective environmental management is based on poor quality assessment of wastewater collected in the course of environmental studies and economical production inexpediency according to the open cycle technological schedule. The paper suggests using technical equipment intended to close the technological cycle for the processed water (gluten suspension) and to seek for non-wastewater corn grain processing, thereby reducing the negative impact of hazardous and harmful factors on the environmental security level. A flotation machine designed to extract suspended protein substances out of gluten suspension is to serve as the basic component of the equipment. The pressure flotation technology under study will require no chemical agents. It is a non-waste process as the extracted foam layer is gluten which is a high protein vegetable stock used as a valuable component of feed corn. Keywords: a loop system, gluten suspension, pressure flotation. Vetoshkin A.G. Processy i apparaty zashhity gidrosfery: Uchebnoe posobie [Processes and devices protect hydrosphere: Textbook]. – Penza, 2004. – 188 p.
Zhilinskaya J.A., Glushankova I.S., Djakov M.S., Viskov M.V.Raschet i proektirovanie sistem obespechenija inzhenernoj zashhity poverhnostnyh i podzemnyh vod ot tehnogennyh zagrjaznenij [Calculation and design of engineering protection providing of surface and groundwater from technogenic pollution]. – Penza, 2012. 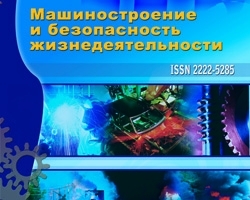 – 401 p.
Kostenko V.G., Ovchinnikov A.E., Gorbatov V.M. Starch production[Proizvodstvo krahmala]. – Moscow: TsNIITEIpischeprom, 1975. – 207 p.
Matov B.M. Flotacija v pishhevoj promyshlennosti [Flotation of the food industry]. – Moscow: Food industry, 1975. – 167 p.
Spravochnik po krahmalo-patochnomu proizvodstvu [Handbook of starch and syrup production] / Ed. E.A. Shtyrkova, M.G. Gubin. – Moscow: Food industry, 1978. – 431 p.